One of the defining moments in Russian history was the decision at the turn of the 12th century to accelerate the development of the fertile northeastern territory of Kievan Rus. The primary figure in this move was Vladimir Monomakh, grand prince of Kiev from 1113 to 1125 and founder of the town of Vladimir in 1108. With his guidance, the area around Vladimir rapidly became a major center of political and economic power. Although much that was created in this medieval golden age has vanished, a glimpse of its power has survived in the white stone churches built in the area in the second half of the 12th century. The first major builder of these churches was the tempestuous Andrei Bogolyubsky, the grandson of Monomakh and the son of Yury Dolgoruky (considered the founder of Moscow). During his reign as grand prince of the Vladimr-Suzdal lands (1157-1174), Andrei made Vladimir a rival in power to Kiev itself and launched several large construction projects. His main residence was at Bogolyubovo, established in 1158 a few kilometers northeast of Vladimir near the confluence of the Nerl and Klyazma Rivers. According to legend, the name “Bogolyubovo” (“beloved of God”) arose from a vision Andrei had there of the deeply revered icon known as the Vladimir Mother of God. Between 1158 and 1165, builders erected at this site an ensemble that included the Cathedral of the Nativity of the Virgin and an adjoining white stone palace – a rarity in medieval Russia. Although the palace itself has long since disappeared, it is survived by a passage connecting it to the northwest corner of the cathedral and by a stairtower where Andrei died of wounds inflicted by conspirators in the summer of 1174. Three years later, Bogolyubovo was sacked by Prince Gleb of Ryazan. In February 1238, Bogolyubovo was again sacked and its walls razed during the sweeping Mongol invasion. In the 13th century, a monastery was founded on the site, but the ancient churches and remains of the palace fell into decrepitude. 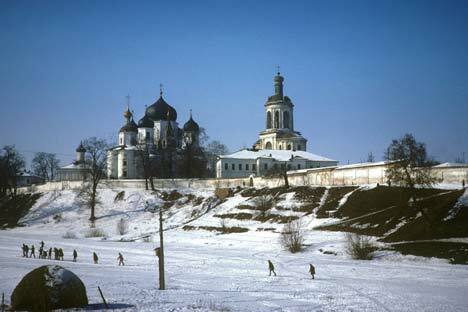 Ironically, Andrei's elevation to sainthood in 1702 hastened the destruction of Bogolyubovo, particularly in the 18th century, the monastery ensemble underwent a major expansion. The greatest loss to the complex was the collapse in 1723 of the Cathedral of the Nativity of the Virgin as the result of an inept attempt to enlarge its windows. A rebuilding of the church preserved some of the original fragments, which can still be seen on the facades and on the interior. The one structure at Bogolyubovo that has survived in something close to its original form is the lyrically beautiful Church of the Intercession of the Virgin on the Nerl, located within walking distance of the monastery. Built in 1166 to commemorate Andrei’s victory over the Volga Bulgars, the church is dedicated to a miraculous vision of the Virgin in early 10th century Byzantium. Andrei endowed the miracle with major significance as a symbol of divine protection. The builders chose an unlikely site, exposed to spring floods near the confluence of the Klyazma and Nerl Rivers, and turned the location’s problems to an advantage by creating an artificial hill, paved with stone, that not only protected the church from high water and provided a buttress for the deep foundation walls (five meters), but also served as a pedestal for the church itself, reflected in the River Nerl. The Intercession Church appears originally to have been supported by a gallery that was subsequently dismantled, but the proportions of the core structure are unusually precise and refined. The structure rises in two tiers: a lower story of thick walls culminating in an arcade frieze, and the upper facades, deeply recessed within the three bays of each wall. The vertical emphasis is reinforced by the receding surface of the walls, which by a slight calculated lean inward, creating a foreshortened effect. The upper parts of the church’s white stone facades display a variety of carved figures, including most notably King David—the ruler divinely anointed by God – as well as 20 high-relief masks of braided maidens. Although nothing is known of the builders of this sublime structure, there is tenuous evidence to suggest that they may have included masons from central Europe. Whatever their origins, they created a lasting testimony to the glory of medieval Russian architecture.